Gr 9 Up –What is the appropriate response to the death of a grandparent? What about when the grandparent was your best friend? WALTON, Will. I Felt a Funeral in My Brain. 304p. Scholastic/PUSH. May 2018. Tr $17.99. ISBN 9780545709569. Gr 9 Up –What is the appropriate response to the death of a grandparent? What about when the grandparent was your best friend? When you’re aspiring poet Avery, you write down your grief. You have dreams where Anne Sexton and Sylvia Plath become talking plants. You seek solace in the words of queer poets. 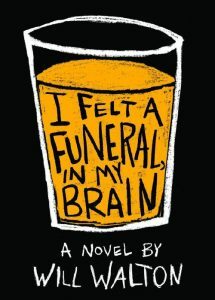 Avery’s nonlinear narration weaves the story of his deep and complex relationship with his grandfather, his mother’s struggle with alcoholism, and his budding relationship with Luca, the son of his mother’s best friend. Readers who are ready for a challenge will be pleasantly surprised with Walton’s storytelling. The narrative’s seamless mix of prose and poetry will draw teens in and wrap its fingers around their hearts. The almost stream-of-consciousness style shows adeptly how complicated love and grief can be. Readers will appreciate the realistic intricacies and heartache. Fans of Andrew Smith and Francesca Lia Block will be floored by this emotional roller coaster peppered with heartrending text. VERDICT A powerful voice who will speak to fans of poetry ready for a good cry.–Carrie Finberg, South Park High School, PA This review was published in the School Library Journal May 2018 issue.